I have to say the whole experience from phone-call to eating the last painfully delicious bites of roti was outstanding. As she made the roti bread, the matron of the restaurant talked us through what she was doing. “Look”, she said, as the bread fluffed up to what looked like half a foot high. “Have you ever seen roti made before?” She patted it back down with her wooden paddle. “Everything here is made from scratch like I do at home for my family”, she added. And we could tell. Even when she made my double, she rolled out the dough by hand into the two small, flat doughy circles before gently placing them into the pan. It doesn’t get more home-made than that. 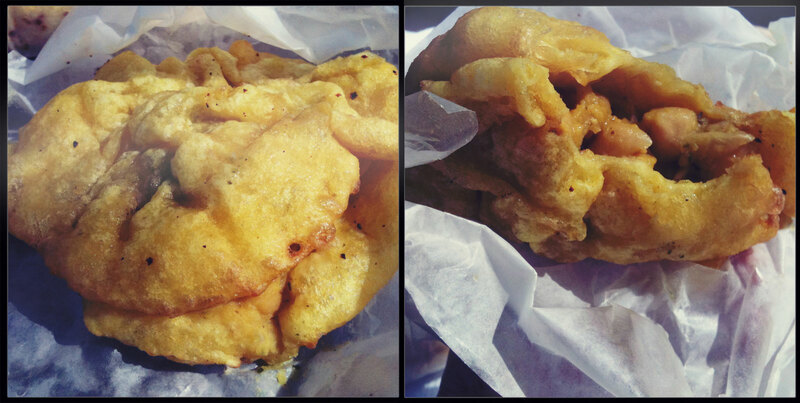 Once they were ready, we took our roti and my double to a nearby park to eat them. I attacked my double first. If you haven’t had a Caribbean double before, I highly recommend trying it. It’s essentially a Caribbean sandwich of two pieces of light, deep-fried bread (usually made of flour, baking powder, turmeric, and a little salt) filled with curried chick peas. I love doubles at the best of times, but this double was in a class of its own. I could easily have eaten four more of them. The consistency of her chick pea filling was perfect – no dripping or mess – just mouthfuls of bursting flavour and a hint of sweetness. The roti were just as flavourful. 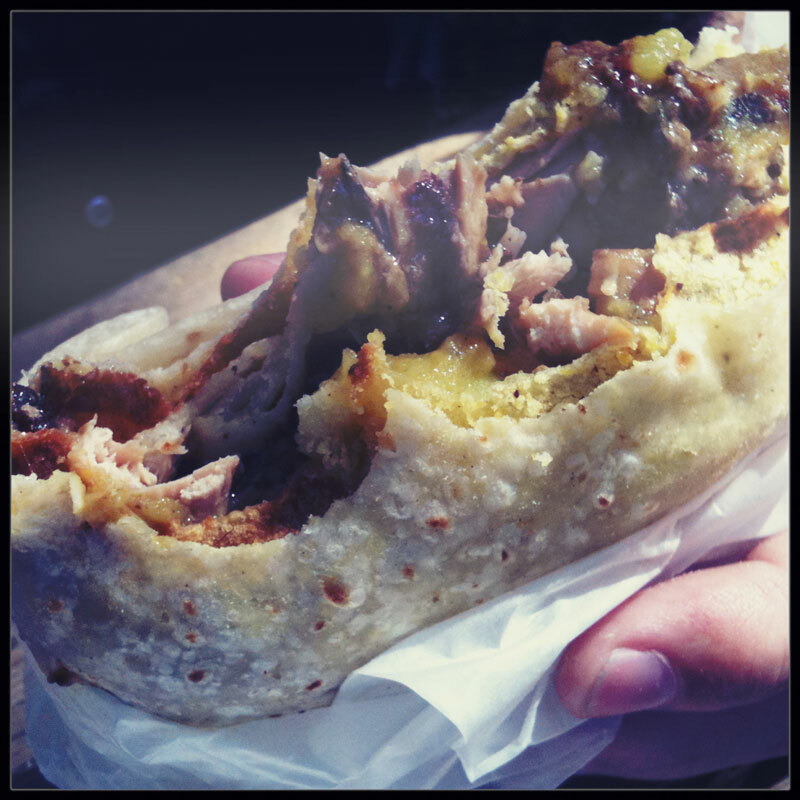 My fiancé had ordered a jerk chicken roti, which she’d deboned for him, and I had chosen the curry goat roti. The jerk chicken was perfectly flavoured – smoky and spicey with a hint of salt. The chicken itself was fleshy and juicy, and came off in plump, succulent strips. Delicious. I normally dislike chicken because it’s often overdone and very dry, but not in this case. I gladly accepted every offer of a bite my man offered me. 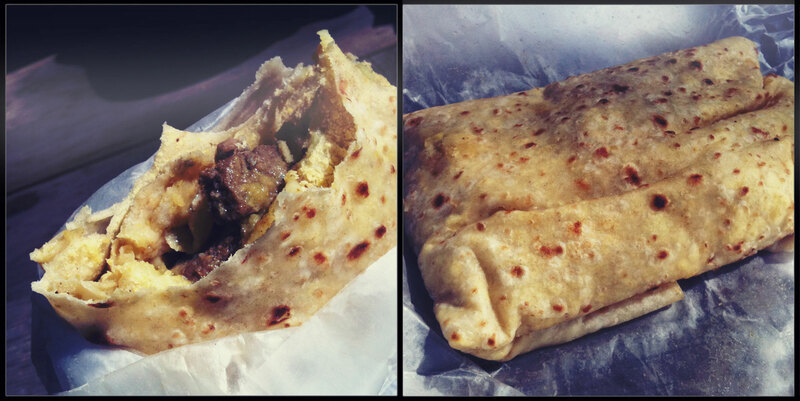 My own curry goat roti was also incredible. The goat meat fell apart easily, and was perfectly complemented by the curried potatoes and the fine spread of the slightly crumbly cornmeal and crushed chickpea paste within the roti bread, which added that little extra flavour and texture to each bite. Again, the consistency of the curry was perfect. We were surprised we could eat our roti with our hands without any sauce dripping out the bottom. Stress and mess-free eating. Even more of a bonus. 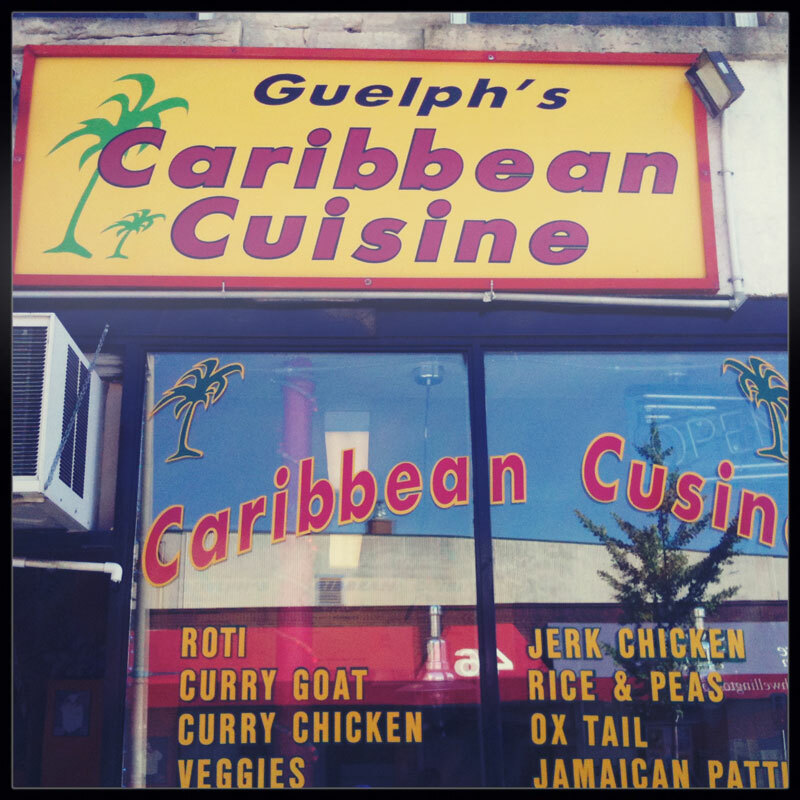 This entry was posted in Reviews and tagged Caribbean, Caribbean Cuisine, double, Guelph, restaurant, roti. Bookmark the permalink.